This recipe takes about 45 minutes from start to finish, including all your dishwashing! 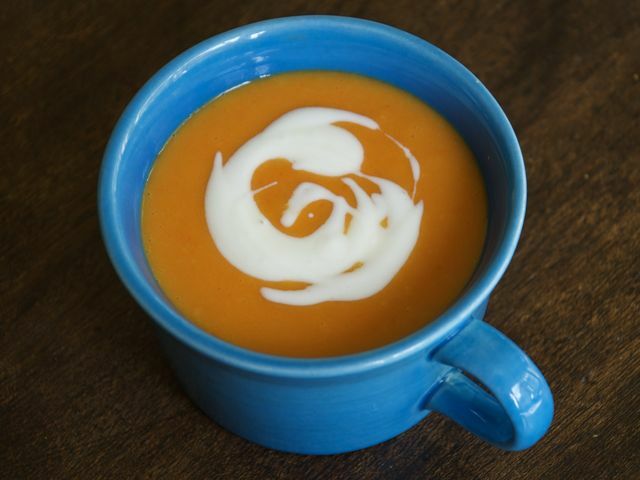 It's a smooth simple soup that's big on flavor and full of vitamin A. Use bulk carrots for this — the big carrots available loose at most grocery stores. It's cheaper to buy them this way instead of the pretty bunched carrots or those little baby carrots (which are, in fact, not baby carrots at all, but the same big carrots broken up and rolled to resemble a baby carrot). This is a fabulous recipe for carrots that have spent a little too much time in your fridge, as the final soup is forgiving and will mask any woodiness or limpness the carrots have taken on with age. Make a bigger batch so you have leftovers — I often eat this soup cold while standing in my kitchen. In a medium saucepan, heat the olive oil over medium heat. Add the shallot and one pinch of the salt, stirring until soft but not brown, about 2 minutes. Add the carrots and stir occasionally, letting them sit still and brown a bit (the shallot will start caramelizing as well), about 8 to 10 minutes. Pour in the coconut milk and water or stock and reduce the heat to low. Simmer the mixture until the carrots are soft and cooked through, about 20 to 30 minutes. Add the second pinch of salt, stir, then remove from the heat. Carefully add the soup, in batches, to a blender. (Remember to leave room in the blender, as liquids expand when heated.) Purée until smooth, adding a bit of water if you'd like a thinner consistency. Return to the pot and heat until warmed through. Season with salt and pepper to taste. Garnish with a spoonful of yogurt, if desired, and serve immediately. Add new flavor components to this soup by trying out different spices. A few shakes of curry powder, some fennel and nutmeg, or a little cinnamon and fresh ginger work very well. Leftover soup may be frozen in an airtight container and kept for four to six months. Leftovers may also be used as a "sauce" base with sautéed scallops or fish. Simply cook down and reduce the soup until thick and serve under fish that has been simply seared or grilled.